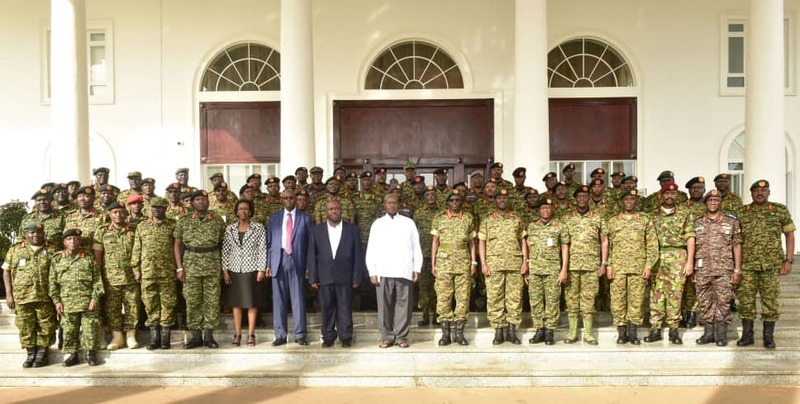 ENTEBBE – President Yoweri Museveni who is also the Commander in Chief of the Uganda armed forces on Wednesday met with the UPDF High Command in a meeting that took place at State House Entebbe. The High Command, which is the top decision-making organ of the UPDF, discussed among other things the security situation and expressed satisfaction with the prevailing security in the country. The country last year witnessed high profile assassinations and murders of women and others government officials including MP Ibrahim Abiriga. Museveni responded by increasing security deployments in the central region. He also ordered strengthening of security of government officials to keep away potential assassins. Additionally, CCTV cameras were installed in several parts of the country to help police in identifying offenders. At the recent East African Community (EAC) Heads of State meeting, Museveni was mandated to spearhead the political federation of the region. The meeting saluted the people of Acholi sub–region and Ugandans in general, for actively participating in the just concluded activities marking Tarehe Sita celebrations in Kitgum district. The Commander in chief consults the high command on national security issues from time to time. The High command comprises the President as the chairperson, The Minister of Defence, the Chief of Defence Forces and his Deputy, service commanders, Chief of Staff, Division Commanders among others.